Designed in stainless steel, LEADER inerting nozzles are projected to withstand foam concentrates, sea water, etc. Allows to attack a fire from outside and safely. Once a hole has been created in the wall of the volume on fire, using the pre-drilling hammer, the operator can introduce the nozzle inside the volume in order to cool and/or directly extinguish the fire. A narrow jet model at 40° for an action inside the volume in length, and a spray jet model at 180°. 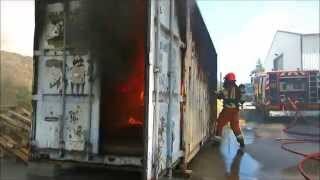 Inerting gas injected nozzle to extinguish a fire inside a closed space (container, roof, etc.) without having to open any door. Made of 304 stainless steel, they are equipped with an inlet filter to prevent clogging of the spray nozzle and guarantee a jet of consistent quality. Inerting gas injected nozzle to extinguish a fire inside a closed space: container, roof, etc., without having to open the space.